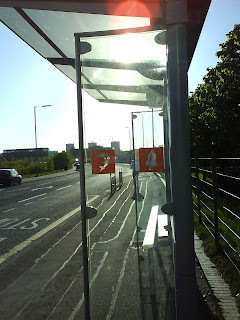 Can we talk about the "newish" bus stops in Glasgow? By the look of them, you could easily be mistaken for thinking you were in some hot and exotic city like Barcelona. Honestly, who the hell came up with the design? By the look of them, it appears that the designer had never been to Glasgow: a city plagued by wind and rain. These weegie bus shelters offer little shelter when it comes to the elements - utter pish! Very good point, we have similar shelters here but the 'seats' inside are on staggered heights so that even the kids can have a seat, they used to be great social meeting points when they were the cast iron shelters, imagine 20 folk standing inside with bags heaving with messages talking and smoking and if it was at night you usually found a couple in the corner having a quick snog - at least thes shelters don't have much glass to clear up after the neds have been having fun. wow they are small eh! They sure don't keep you out of the wind and rain! They need to be made of wrought iron to withstand full ned attack. I mean the glass probably isn't even pish resistant.